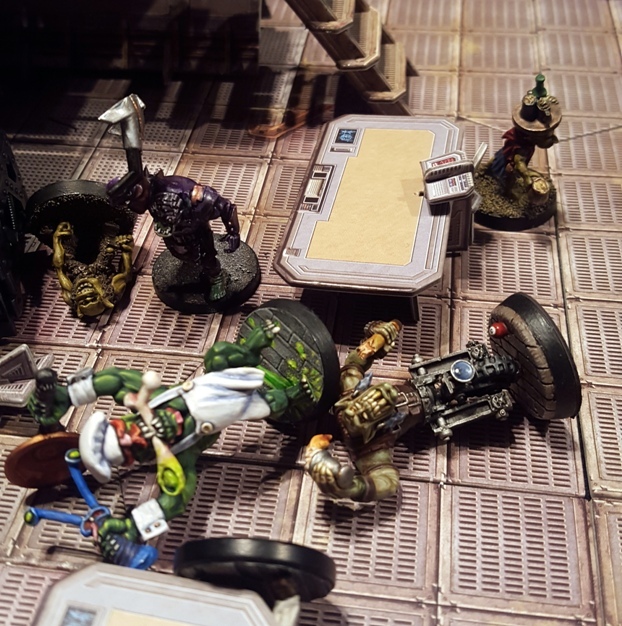 theottovonbismark, Just John, Mr Saturday and non-blogging gaming co-conspirator PB got together to play Brewhouse Bash – a short simple game provided as cardboard components in White Dwarf in the 90s – recently. More details on the Brewhouse Bash are in a previous post, so I wont repeat them here. 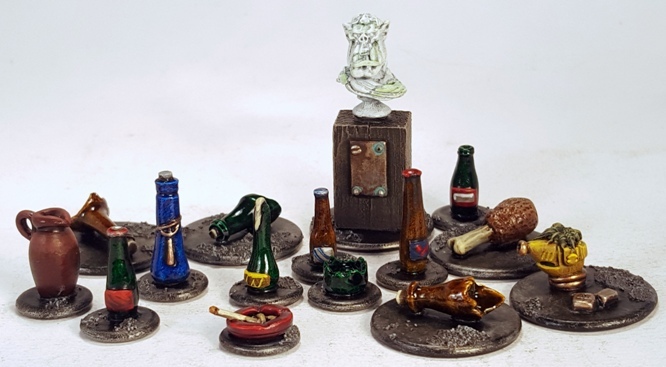 Although they are represented by cardboard tokens in the original game, we figured that with a 3D bar and furniture that some bottle models would be nice too. 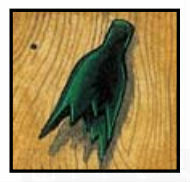 theottovonbismark volunteered to make a range of props from green stuff. He then posted them to me and I quickly painted them before the group got together for the game. The set includes various bottles, both broken and intact (including a bottle of refined and very rare “Tears of Isha”), an unlit molotov cocktail, a jug, some suspicious looking meat on the bone, a plinth mounted bust of “Orkimedes” and a bong made from an Imperial Fist helmet. I dont think that most folks actually grow weed in their bongs, but thats artistic license for you. Each of the Brewhouse Brawlers was prepared by one of the attendees, of which there were five. Stupidly, I forgot to take the group shots of the Brawlers (or the attendees) which means that I only have photos of three of the Brawlers as taken from the respective blog posts. Apologies to the two lads whose Brawlers do not appear here. Patrick Swayzork, local boy representative of this blog. Although lots of laughs, the game itself was too short, rapid and daft to be worth recording in excruciating detail. Some brief highlights are shown below. Starting as he means to continue, Patrick Swazork grabs the bust of Orkimedes and leaps from the balcony and smashes One Eye to the ground. Caught unawares while reapplying hairspray, Da Chef delivers Swayzork his “Full Orkish Breakfast” [FRYING PAN CLANG NOISE]. Patrick never got back up after that. Swayzork continues to reapply baby oil under the table while Da Chef batters Da Ork Wiv No Name on a table and One Eye drops Rubbaleg. In a display of surgical opportunism, One Eye is left as the only standing bar patron so he won. I think. I cant remember as I was laughing. This game was a test to see if the core rules engine as written was robust enough for an enjoyable game. As expected, they were, but also as expected, the game needs an additional “something” to give the patrons reasons to move around the bar other than to clatter each other. I have ideas for how to do that, but I wont go into them until I have something finalised. We still had fun with the game as written, with a lot of added value being brought by the lovely props and models that everyone contributed. This wont be the last Brewhouse Bash. This snippet alone was enough to gain a chortle – right about the ‘full orkish breakfast’ bit 😉 I’ll be interested to see how the upgrades go! My knowledge of Swedish cuisine was too ignorant, too Ikea-centric to go for a cheap meatballs gag, so Swayzork got the full orkish instead. The upgrades will be simple, the last thing that I would want is to bog things down. I do want to provide incentives for the Brawlers to move around the map though. Ill keep you informed Cap, thanks for the feedback! That was a lot of fun, as much in the preparation and seeing what folks made of a more unusual theme as playing the game itself. I’d be interested in doing another brawler at some point, one of those surly bar fly marines you see in the Rogue Trader rulebook mayhap. It was a load of fun, both to play and to prepare for. In many respects it is – amusingly enough considering the subject matter – a benchmark for a group project. 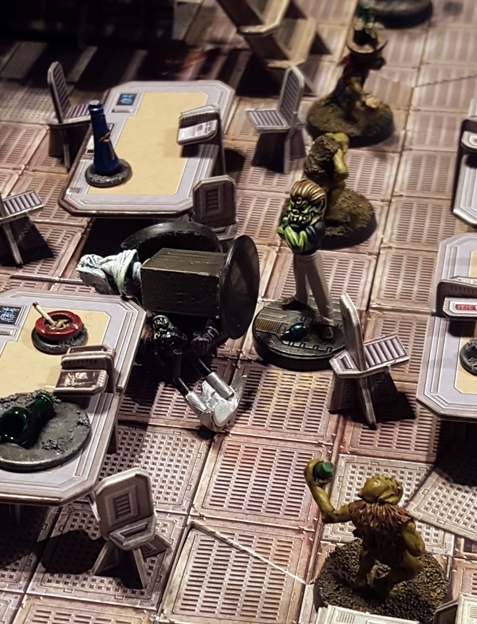 If I can get this off the ground the way that I want to, then I very much envisage the final modified game as a sort of Mos Eisley Cantina affair. Something that a bar fly marine with his power armour in some sort of power saving mode would fit right into in other words. Pure brilliant! I had this game, maybe still do… There will be some diging in the dungeon. I am quite interrested in what you come up with to “season” the rules. The rules as written are fine for making a simple sort of combat work, but like many games from GW, they dont really give the characters any motivation to engage with each other. I have plans to sort that problem out, but for now I will keep them under wraps. It will be very simple though, or else the project just becomes something else. Thanks for the feedback Johnny. I will let you know when progress is made. The set, the concept, the props, the minis! Your social encounter games from a couple of years ago came up in conversation after we played this game actually Guiscard. The Brewhouse Bash is a much dumber sort of a game than Pulp Alley, it isnt intended to fill the same niche: its very much a thing that takes half an hour and generates a few laughs. That said, the sorts of things that I am planning to include, will take some inspiration from your Social Encounter PA games. Definitely check out what Guiscard did with Pulp Alley in “The Goodwill Ambassador’s Tour: Ep. 1 – A Party to Remember“. Its a social adventure via Pulp Alley. Its really rather clever and unique. It could fail to inspire a gambling den game (set on a riverboat perhaps?). Thanks for the feedback Panama! 😂 Nice one – great models and a cracking idea… made me chuckle throughout. Noob question, but where did the original rules come from? I included some info on the game and the White Dwarf number etc in the Patrick Swayzork post last week Alex, but I forgot to link to in in the post above. That has been done now. Well done Cheetor. I love the props The OttoVon sent you. (For the purposes of this fight perhaps he should be the Otto von Bismork. He likes his green guys, obviously.) And you set the thing up well. Fantastic looking game. As I mentioned elsewhere, it was a collaborative effort that was more than the sum of its parts. Loads of fun too. Haha, you made me laugh here! Looks damn nice! Moar, we want moar! And some more beer!! There is MOAR in the pipeline. Im not sure when, but in the the next six to ten months I guess? Thats pretty vague, but thats the very best that I can manage in hobby commitment terms. 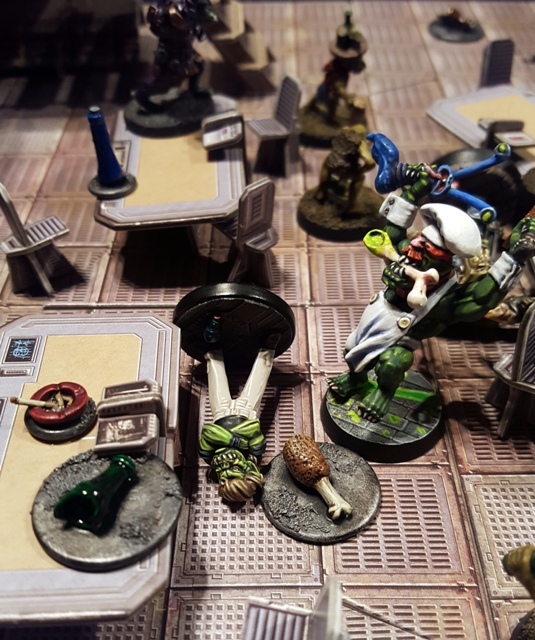 Tabletop gaming is a peculiar hobby, with a weird mix of activities required by the participant. Nobody expects a poker player to sculpt, nobody expects a chess player to paint the pieces. Conversely, I dont think that tabletop gaming is worth doing unless all of the disparate elements are embraced. This game was a good example of that. Im glad that some of that translated into the post. Thanks for the feedback Gabbi. Good point… the “spend a lot of $$ on an army, then hastily blob three colours on it and play with it” mentality always baffled me. 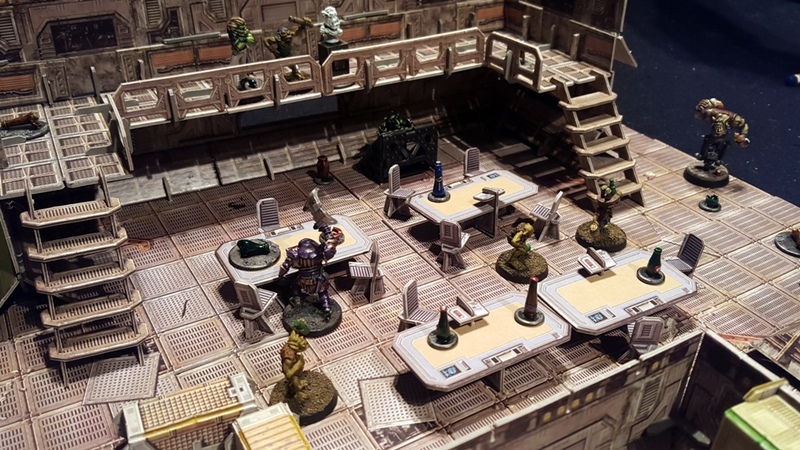 Even a half decently painted set of figures looks really cool on the game table… and a well-painted set looks incredible. This post being a good example of that. Sidebar, I feel like if simple, short, silly games are your thing, you might enjoy the card game “Poo”. It’s a game about feces-throwing monkeys. 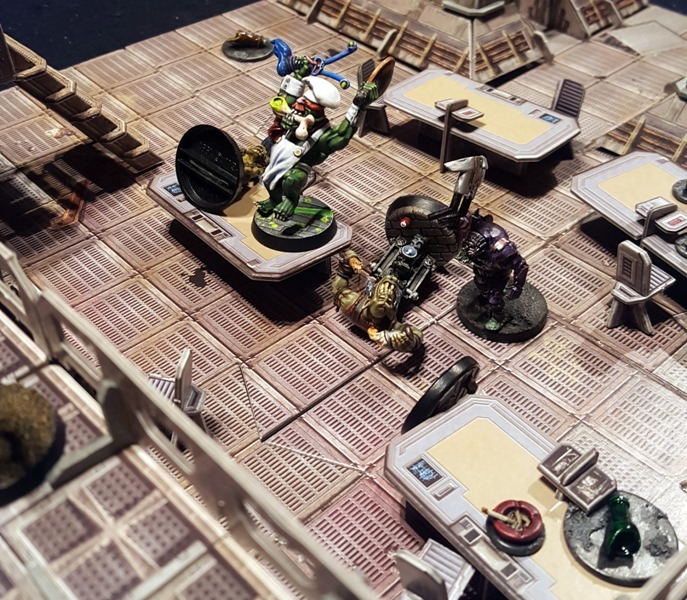 While I enjoy it when my games are well designed, I am more forgiving of rulesets for miniature games than I am for boardgames, because miniature games are a spectacle in ways that boardgames are not. I dont understand why anyone would play 40k with unpainted miniatures for example, but I can see appeal of playing that game with painted figures. As for “Poo”, it has been mentioned a few times during gaming sessions but it has yet to hit the table when I am around. I think that ne of my gaming group has a copy, I will check it out. “Poo” is nice because it takes about 3 minutes and one test play to learn, and then it’s ultra-low investment. Game Master stuck in traffic and the rest of your group has 10 minutes to kill? Open beers, play three games of Poo.